We are very excited to announce our second litter of 2016: born January 9th! 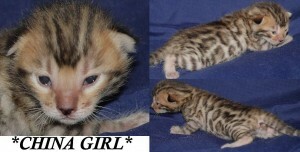 Champion Poolside Rascal Cats of KotyKatz strikes again with another litter of gorgeous rosetted babies! Mom, Bengalscape Estonia of KotyKatz, has thrown in the right mix of genetics to produce these outstanding little Bengal kittens. 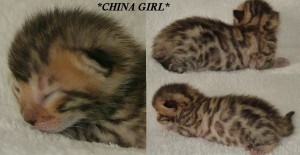 Of the brown rosetted kittens we have this little female, China Girl. Look at that adorable little smiling face! This is our David Bowie tribute litter, remembering him with kitten names like Lazarus, China Girl, Ashes to Ashes, and Fame. Did you know this song was actually co-written with Iggy Pop and appeared on one of his albums first? It was later released by Bowie as a single and reached the number 2 spot in the charts in 1983. 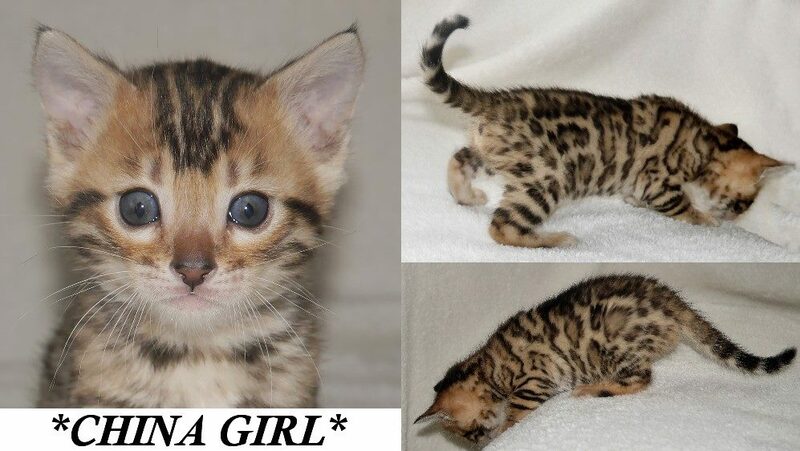 This entry was posted in Bengal Kitten Gallery, Gallery and tagged bengal kittens, China Girl, David Bowie. Bookmark the permalink.